I have seen some ice fishing houses (ice shanty is a term that would not do these justice) but not one of them could compare to this Michigan fishing resort! 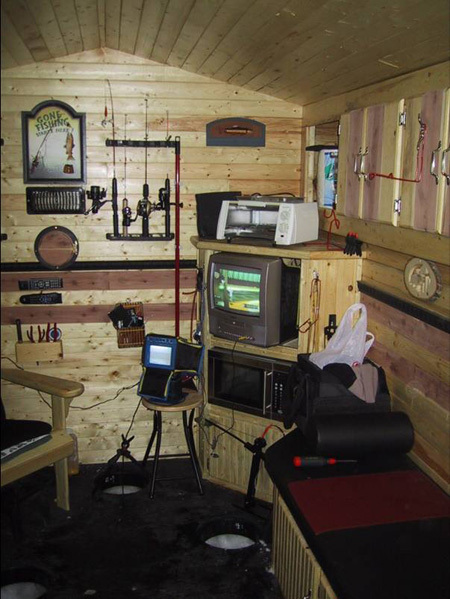 It is the ultimate fishing home, is portable and I am seriously considering writing the designer and buying the ice fishing house plans if available. Take a look at the pictures below and you’ll be amazed! What would something like this cost? 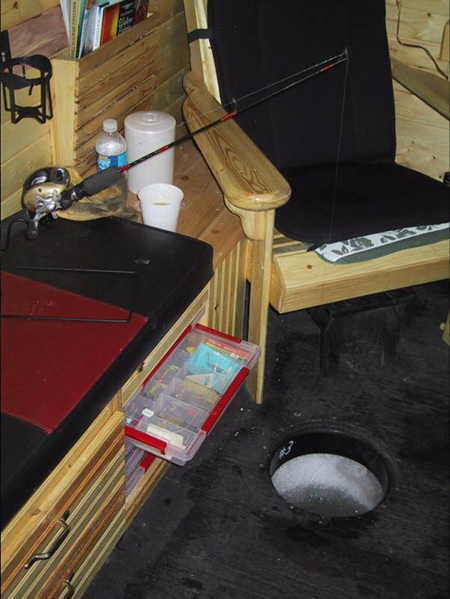 How much would you pay for ice fishing house plans that would allow you to build a beauty like this? How much would you spend to stay at this Michgian Fishing Resort? Just think of the stress this would relieve? If you know of similar ice fishing houses, please let me know and I’ll be happy to post them as well! could i have the plan for this castle its a REALLY nice one!! Love this plan design . . . are the blue prints or designs available anywhere? Would love to get my hands on plans for this bad boy! Are you willing to give out some plans? Can you send the measurements of the shack? Is there any plans available? If so can I get a copy? Love the shack looking at building one this month! Possible to get the plans and the weight of this beauty. Also how big of a snowmobile to move this around? Would like to build a lighter version of this great fishouse. Are the plans available? Please let me know the details???? how much u want for them?? i am soo game for it i love it. it get cold as hell up here in South dakota. i need one!!! Please email me a copy of the plans for this Ice shanty ( ice castle). Nice job, It looks great! I’d like to have the plans of this shanty,, Let me know if it’s possible and how much. I would love to get the plans for this awesome place. Thanks in advance if someone chooses to do so! Could I also get the plans for this house? My name is Jason, & I would really appreciate it if you could email me those blue prints for that ice fishing house as I am preparing to start up a ice fishing business and would love to build at least three of those houses. I, like Chaz, have an old camper that we tore down and are now left with just a frame. Could you email me some plans for a fish house? It’s an 8×20 trailer. I want to make something amazing, so any help would be greatly appreciated. I’ve been searching the Internet and can only seem to find floor plans, but nothing that has how to build the walls. Could you email me the plans for the fish house? I am looking to transform an old camper i just purchased into something just like this. That would be very helpful! Jim I have the plans and price for this beuty, no Im not the originator, but have built plenty of beuties similar to one pictured and it isnt as bad as one might think, identically to this one would cost 14,000.00 with a wheel lift system not shown, as the one pictured has skis and is transported by snowmobile, must have 12 inches of ice and can be hauled on a flatbed or wheel lift system as mentioned earlier, it is all notty pine and red western cedar, the bunks are leather as shown and the firebox is fixed to the floor, it is all insulated and very warm, been in this one many of times and no its not for sale, but will build one a like if interested please E-mail me with any question in regards, also the floor is 3/4 treated marine grade plywood and the holes are catch covers with inserts……..
Can you tell me where I can get plans for this or purchase this ice house, thanks. How is this transported? And how is it lowered to the ice? Beautiful hut. Would it be practical? Would it be more difficult to maintain? I would also like to see plans. I don’t have the plans, just posted the pictures – but if someone came up with some ice fishing house plans for this shanty, I’m confident that they would do well selling it as an ebook! I’d be the first one to buy it. Awesome fishouse could you maybe send me the blueprints for the fishhouse and how much did it cost. oh thats probably the most awesome ice shanty I have ever seen! I would love to hang out in this on a cold winter day. I cant believe its real! well whut would it cost to build a CHEAPER version of this ? im trying to figure this out for a projact at school . We are very much impressed with your ice shanty. We are wondering what you used for the liner for the holes. Thanks for your time. Tom from Wisconsin. My wife would shoot me if i built this because as soon as the ice was thick enough she’d never see me until spring!!! This is the best ice shack i’ve ever seen and believe me i’ve seen plenty in my day. how much for the plans. please let me know and is this very heavy thank you. I would Have to say that is one ot the nicest shacks i have ever seen.Lots of detail and creativity.A home away from home.Great Job. As for plans All You have to do is look at the pictures. it’s all There. A little bit of know how and your own creativity goes a long way. Sign me up for a copy of the building plans! This ice fishing house is not in Michigan – in fact, its not in the US at all – its from a small lake near Saskatoon Saskatchewan. We’re getting closer to finding more information and obtaining blueprints! want to have a fishing shack on the lake were i live so that i can spend the night and entertain a guest or two! love this setup can i get a set of blue prints i own a body shop an love to sell them if some else builds them. Fit for a King. I see the microwave, toaster oven and TV. Is this palace running on 110 or 220 amps? Can you haul it with a snowmobile or do you need a Cummins Diesel 4×4 to haul it out. How many hours can a guy spend in this before the wife kicks you out of your real house? its nice , but if you want the true secrets to a light , but durable , with a lot of party inside type of shack, duck lake is the place to be! it catches fish too ! Totally amazing! couldn’t believe it tough, my fishing shack was pretty good! Great job! I’m a Brit, having never experienced such temperatures, asked my friend how come when a fire is built inside the room, it doesn’t melt a huge square and sink the Ice House……? Douh! I can’t wait to see it! Please, send me your pictures and I’ll get them up on the site. As you can see from the comments, there are a LOT of people looking for plans and I’d be happy to direct them your way – perhaps you could sell them and help pay for cost and materials? Just thinking out loud. I am an Industrial Arts Teacher, I live in Cross Lake, Manitoba which is in Northern Manitoba. I am just letting you know that my grade 11 Building Construction class is duplicating your awesome ice fishing shack. We are trying to get it done the first Ice Fishing Derby so we may show off your hut for all to see and to give you some publicity aswell. Love that house anybody have plans for that house I would love to have them. I plan on building a house for next season so if anybody has any good plans or where I should start I would love to hear from ya . Awesome Shack! Very Sweeet! That would def be my new address. What did you use for the black ring around the hole! Enjoy…….play safe and Happy Fishing! 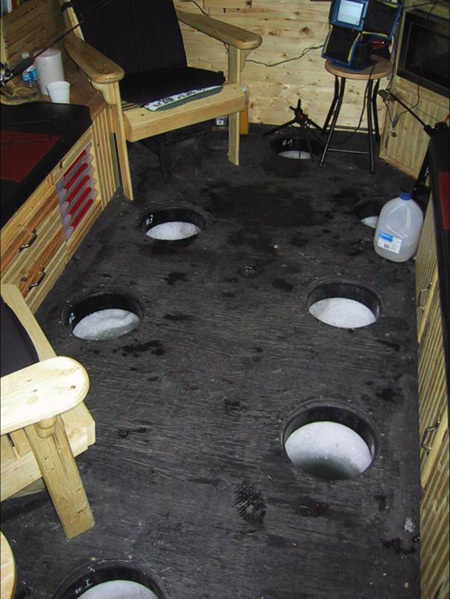 Hey guys, I would gladly post the plans for this ice fishing house on the site for all to have free of charge, but unfortunately, I don’t have the plans. Perhaps someone will write up the plans and post them for all to see! i wish the plans will be avalable soon thanks. Hey Jim, I am looking to build a shack for next season and came across this page. Are the plans available, I see a ton of requests for them so I figured I’d might as well ask. Thanks. Can you tell me where I can get these plans? Or are these units sold like this? Would like a little more info on the size of house. What type of fram is under this house, or do you haul it on another trailer to and from the lakes? Can i get a set of blue prints i’d like to build one. what a great job! You wanna talk about ice houses, wow, that is perfect! If you want to get away, this would be the perfect place! Beats drilling holes in the open I like do! What a house. I would like to build one. Are the plans available on it? Is there a material list and plan available? How much does it weigh? This looks pretty awesome. Has anyone gotten the plans for this yet? Great shack, but my wife may kill me; I’d never be home. 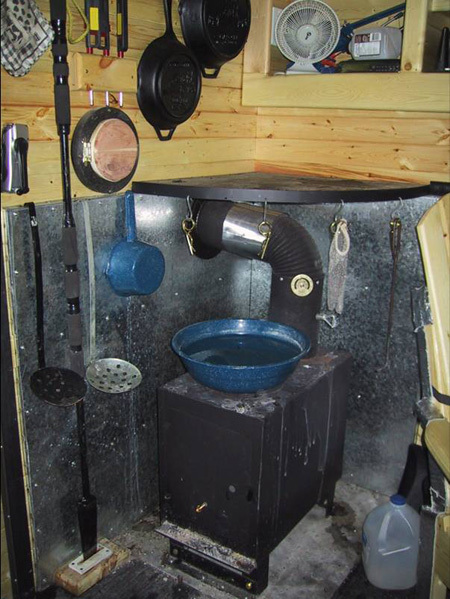 Please send me the plans for this dream shack, Maine winters aren’t long enough, but I would definetly make the most of hard water season with this baby out there. This is one of the best Ice shacks that I have seen. What is used for the holes. It looks like 5 gallon pails cut off. please send plans. I love it! Could you please send me the plans. I live in Northern Ontario and think it would be perfect for lots of great fishing times. Thank you. Tim. please email me a copy of these plans for this awesome ice fishing house. I was born and raised in Wisconsin. I moved to Idaho. I love my ice fishing, however no one out here ice fish’s like we did back in the frozen tundra! 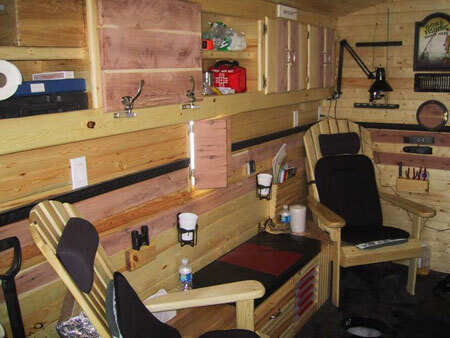 Hey man that is one awsome fishing shack no insult intended when i say shack.I would love to have one like it if you have a set of plan would love to get a set or perhaps you can tell me where to get one. Black absorbs heat better than a light color same as a rough surface absorbs heat better than a smooth surface. 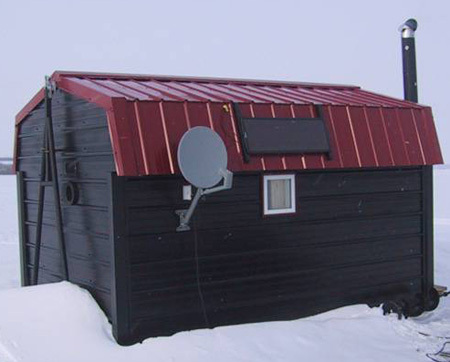 Many people paint the Ice Fishing House black to help keep the shanty warm naturally, however, the shanty is usually on some kind of track and I’m guessing that the amount of heat transferred from the shanty to the ice would be minimal, if any, compared to a white house. I could see if the shanty was all metal, including the bottom and it was in direct contact with the ice that there would be some difference compared to all white, but that’s probably not the case, right? In fact, just the angle of the shanty in relation to the sun can have a major impact on heat. Orienting it at 90 degrees to the sunlight compared to 15 degrees would cause the shanty to absorb more heat. Cool shanty? If so, send me your pics (jamesmaurerllc at gmail.com) and I’ll get them posted! Hey everyone I need some help fast. I’m buying a ice house with 4 other guys, two of the guys are against a black ice house because they say they heat up and make the house sink. others I talked to said they were crazy. is this true is it bad to buy a black ice house. Please respond we found a nice black one within our budget. Did anyone get the plans to build this? This is nothing short of amazing, well done to who ever built it. For the people looking to build one and don’t know where to start… take notes on this one because it is beautiful. I would have a hard time leaving this home away from home. It looks to be on skids due to the fold up tongue and coupler. The inside is gorgeous, nice warm north woods feeling. Once again well put together. How can i get plans to build that? how much did it cost to build? Super cool shanty! How much did that cost you to build it??? Wow….I don’t have to look any further. I’m building it. I would like the plans for this Ice Fish House also, please let me know the details so I can purchase a set. Ever find the plans for this ice house? I’d love to buy a copy. Nevermind getting or buying plans. When are you selling the hut ? haha. But plans would also be great to see. I’m going to try and write up some Ice Fishing House Plans based on what I see here and if I’m successful, I’ll post them here. I’m going to have to use a bit of imagination and estimate the size and go from there. If it’s not exactly like this one, that’s OK. I’m even going to try and get the paint to match! Like everyone else, love this hut and would pay for set of plans any info please post, I will buy. I’m up in northeast Maine thanks! 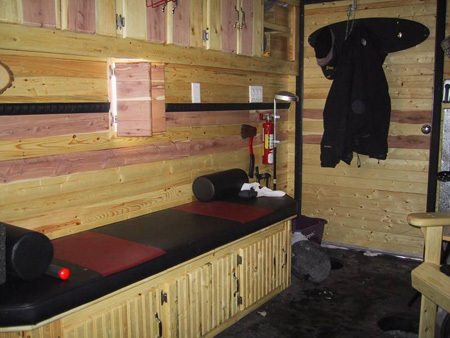 I would love the plans for this ice shanty for school… please send them, I need this! My dad’s dream home, a house on the ice! Fantastic, this is an ice shack! But for those looking for the plans, Dream on! An furthermore, you can do it! Seriously, the pics are there, and with time, money, wait, lots of money, and know how, You can do it. I am going to build my own, maybe not this elaborate, but I am going to do it! Look at some of the crap shacks that are out there. Take a summer and take your time, ask those who have built them before and learn from there mistakes. Go for it!! Nice shack who ever built it, and oh ya, GO BLUE!!!!!!! I just love it, would love the plans if you can get them. How much does it weight though it must be heavy?? It’s good if you have a cottage and you’re there all the time and don’t have to pull far. Up here you have to watch lots of slush and changes in Ice conditions!!! Great though!!! Very nice ice shanty! It would look good in Cape Breton! I would like to build one like this, do you have the plans? I would appreciate the plans for this shanty as well. I love this ice fishing house! You need to hook me up with the plans because I’m going do this, but one up! Awesome! Awesome! Awesome! Can I get plans for this shanty too? Exactly what I am looking for? Thanks! Hey, very nice ice house, could you send me the plans for the ice fishing house so me and my buddys can build one ourselves this summer? I would like to build one like this. How do you lower it to the ice? And, can it be towed on the road? If you have plans for it, please let me know! This would really help me if you could get me plans. Nicely done, i like the drink holders! a definite must for successful ice fishing! priced out the material and so fourth no immediate pricing is available but we should have something for you in the near future as we discover prices and obviously prices will range depending on size and equipment. I would like to build one like this. How do you lower it to the ice? And, is it towable on the road? If you have plans for it, please let me know. Mark, get your teacher to do his job OMG!! I am looking to build a fish house, not quite that fancy. Wondering if anyone has plans they are willing to share. Hi, I’m 17 years old and really like you ice shack. I was wondering if i could get blueprints of how you made the ice fishing house and how much it cost. I spend most of the time ice fishing with the guys. If you could email me that would be great. Thanks and good luck FISHING !! Took the words out of my mouth Benjamin. I’ll take the stove, the seats and the storage, but leave the TV at home. What are doing with a satellite dish on the shanty? Doesn’t anyone still go out to do what they’re supposed to be doing? fishing. hi, my metals class at school islooking at building an icefishing shack and we need some plans to build one. We want to build it out of aluminum, or any metal really. We want it to fit around 6 people so if anybody has some plans for this it would be a great help. If you can find the plans for this ice-water manision, I’ll foot the bill for them. Or, if you can tell me where this fish-house is, I’ll buy it. . . . or kidnap it. Hey, can you give me any ideas on how to construct a ice house. I have ideas but not totally sure how to start. where was this house when you discovered it?what lake? near what community? Impressive – always searching the net for new plans. This is definitely one that bears looking into, should you be able to obtain the plans. Best shack I have ever seen no doubt I’m planning on building something this upcoming summer. It would be great if you could send a similar plan layout. I’m still trying to find the person that designed this and obtain the plans for the ice fishing house. I’m not sure what the floor is made of, but it looks like wood? Trust me, if I find the designer, I’ll post all the information here! Awesome job, and definetly the best I have ever seen. Probably tough to go home once fishing in it, perfect. best fish house I’ve ever seen. would love to get plans for it. Are they available? Please let me know if you can get the plans for this castle on ice. I would be very interested in getting some also.